Off-Ice Hockey Training - Pro Ambitions Hockey, Inc. In past decades some individuals inherently possessed the pre-determined genetics suited to succeed in a sport. These ‘natural athletes’ did not put a great deal of time and effort into enhancing their physical traits. Today there is a shift towards more emphasis of scientific conditioning methods to accelerate development and optimize performance. Players are continually becoming bigger, stronger, faster, more agile with greater skills, forcing competitors to do the same. Today even the world’s best athletes look to exploit everything within their control to gain a competitive edge. If athletes hope to optimize their sport technique and game performance, they must first develop the physical tools that will allow them to successfully integrate sport coaching into their game. Repetitive skill rehearsal in absence of the very physical tools that are drawn upon for skill execution will generate few results. This is the rewarding and fulfilling part of coaching and training – teaching athletes to be in tune to their body, accelerating their development and teaching them how to produce superior skills and game performance. It is important to note that often exercises are not in of themselves sport-specific. As you will learn, over the course of several articles, there are many tremendous ‘athletic’ exercises. These are exercises that get players off of machines, into standing and dynamic positions, and draw upon the entire body as an integrated unit to execute the technique. Squat jumps, zig zag lunges, lateral bounds, and many plyometric and medicine ball drills are examples of athletic exercises. But it is only after the coach manipulates the prescription variables and modifies exercise technique that makes an exercise truly becomes hockey-specific. Sport-specificity has application for elite athletes and recreational athletes alike. I don’t advocate programs heavy on sport-specificity for youth athletes however. Young athletes are already streamlined at too early of an age. Early sport specialization, combined with the predominance of sedentary activities (TV, internet, video games) produces players who do not have the base of athleticism needed to optimize sport-specific training results. Youth programs should focus on movement skills and athleticism, with some sport-specific application added in. Much of sport-specificity is about teaching athletes to move better, such as speed, agility, quickness, balance, stopping ability, turns, pivots, jumping, sliding, diving, lateral movement and reaction skills. I assess and teach movement skills as the critical foundation all training and skills will build from. Stopping balance, ground-force application, weight transfer, sequential firing, hip triggering, and joint positions are samples of the movement skill checklist. Essentially, you are teaching movement efficiency, being able to move from point A to point B with fewer steps, greater speed and more visual awareness, while expending less energy. Being in tune to mechanical breakdowns is part of the initial evaluation process and also key during each and every work out – exercise prescription is modified on the spot when you detect mechanical errors. If this is from fatigue, you may shut down a speed drill premature to what the prescription dictates. Loss of mechanics increases the risk injury during intense training. Mechanical breakdown may also mean the athlete is not in tune to her body, and lacks the coordination and physical tools required to optimize efficient movement mechanics. Here we look for strength and flexibility imbalances, joint mobility and firing patterns, which may be interrupted from injury. The bottom line is that hockey players do not need to sit on machines. They need to move, be active, dynamic and learn how to generate better movement, power and skill from their entire body. 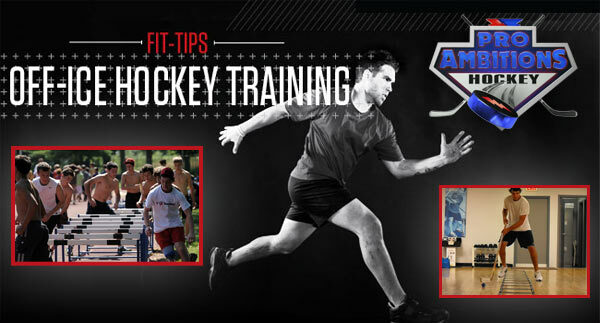 Hockey players love to train athletically. Yong players need to artificially improve athleticism, and older elite players respond best to athletic oriented exercises. Players seem to believe so highly in programs including such exercises and methods as their common sense tells them this is something that will greatly help performance. Compliance and effort levels observed always seem higher and athletes seem happier in training with confidence that their game will improve. Towards this end, coaches and trainers must continually communicate with athletes to explain how particular training will transfer to competitions. Also present it for what it is – an exciting opportunity to improve! Defining very specific areas to work on and explaining the utility to game performance reassures players that the time and effort they invest will accrue positive game results.